Definition - The person who signs the Booking Form ( Main Holiday Maker ) shall be known as the Hirer. 1.Bookings will only be Accepted from Hirers who are over 21 years of age and above on start of holiday. 3.The Hirer is responsible for the Caravan and Signed as Stated on the Booking Form. 4.All changes to a Booking Form are allowed only by Prior Agreement with the Caravan Owner in writing. 5.The Hirer is Responsible for the conduct of all persons listed on the Booking Form as well as all guests and visitors. 6.The Hirer agrees that the details of persons listed on the Booking Form shall be registered with the Caravan Owner. 7.The Hirer must give access to the Caravan if reasonably required by the Caravan Owners OR Park Manager. 8.The Caravan Owners reserve the right to refuse any Booking without any obligation to give a reason. 9.Palins and Ourselves will not be responsible for any personal loss or injury, however caused or sustained to any person or vehicle (including any persons under age 18 years of age). 10.Smoking and Pets is NOT permitted within Caravans. 11.The Caravan is to be left in a Clean and Tidy Condition. 12.In Case of any Maintenance Problem(s). DIY repairs must not be attempted. 13.All Electrical Appliances in the Caravan have undergone Annual Safety Checks. Use of your own electrical items is at your own risk. 14. Cheques to be made payable to Mrs Lisa C Thomas. 1. The Hirer and all people listed on the Booking Form, your guests and visitors must Obey with the Site Rules and Regulation at all times. 2. At all Times Noise must be kept at an Acceptable Level. 3. All Speed Limits must be Observed at all times. 4. Parking is allowed IN ALLOCATED space only. 5. No Littering on the site. All Rubbish / Refuge must be Disposed of in Big Dumper Bins situated around the Site. 6. BBQ are allowed on site (although these must not be situated near to the caravan). 7. Gas Bottles only to be exchanged by the Caravan Owners, Palin's or there staff – please Contact Caravan owner or EMERGENCY Onsite Number if you run out of gas. 8. No Firearms or other Offensive Weapons are Permitted . No Ball Games between the Caravans. No electric or petrol scooters allowed on site. 9. If you are asked to Vacate the Caravan Site, by Palin's or their staff, for any reasons what so ever the Caravan Owners shall not Refund any Money Paid. 1. A Deposit of £60 Per Holiday to be Paid for Provisional Booking or it will be Cancelled. 2. Cheques to be made payable to Mrs Lisa C Thomas. 3. The Balance is to be Paid no Later than Four Weeks before the Start of the Holiday. 4. Accommodation will be Available from 2:00pm on the day of Arrival till 10:00am on the Day of Departure. 5. The Hirer shall pay £60 Bond at the time of Booking, This Bond is Fully Refundable at the End of the Hire period. The Caravan Owners Reserve the Right to Withhold some or the Entire Bond and or to Bill the Hirer for the Additional Cost of: (1) Replacing or Repairing all Damage, (2) All Breakages, (3) Charge for Cleaning the Caravan , (4) Cost of Removing Stains or Replacing as new. All Breakages, Damages and Stains must be Paid For!!! The Hirer must inform the Caravan Owners within 24 hours of Arrival; All Defects, Inventory Shortages and / or Breakages etc. Failure will result in you being Responsible and your Bond Being Withheld. 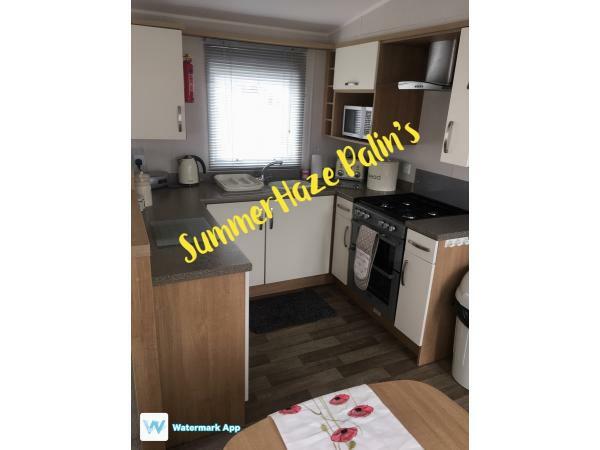 SummerHaze Lovely Caravan on Palins, Towyn. Palins is Situated near the huge Market and Car boot and Tir Prince Funfair. Park is Operated by Barrier, which requires a Fob to Gain Access, There is a refundable Deposit to be paid to Reception on Day of Arrival at a cost of £30 and will be Returned at the End of your Stay. Fun Pool is £2.50 a day for our Quests (under 4s) free, payable at Reception. ClubHouse is Free. Deposit of £60 will Secure Booking and this will act as Security Bond which will be returned at the end of your stay if Caravan is left Clean and Tidy and No Damages. No reviews found. If you have recently stayed in this holiday home please leave a review, it only takes a few moments and will really help future guests when they are searching for holiday accommodation at Palins Holiday Park.